This market is a beautiful, very lively place with many colors. 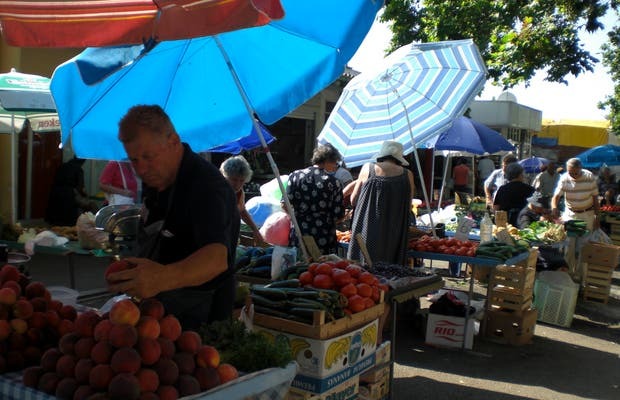 Croatian food is generally very good, the fruit and vegetables are delicious, it is a very fertile land and sunny so it was logical to visit the site. The market starts right at the golden gate, when you leave the imperial enclosure of Diocletian's Palace. The fish market is on the other side of town, in a purpose built building, but this market is of vegetables, fruit, cheese and honey, outdoors there are other stalls that close each day at the hottest hours, and re-open at 6 o'clock. Prices are very low, and if you are lucky enough to be able to buy some do not miss the delicious cheeses of the region, a large cheese costs 10 euros or so and they are exquisite, the most famous is the one on the island of Pag, it is more expensive, 15 euros per kilo.